, one of the most intelligent, learned, and affecting dramatic composers of modern times, was born at Avellino, a town about twenty-five miles from Naples, in which city he had his musical education under Leo and Durante. The first opera to which we find his name, is " Riccimero Re de‘ Goti,’‘ composed for the Argentina theatre at Rome, 1740: and between that period and 1758, he composed for that city fourteen operas, besides others for Venice and different Italian theatres. From 1758 to about 1768, he resided in Germany, being engaged in the service of the duke of Wurtemburg, at Stutgardt, or rather at Ludwigsburg, his new capital, where Jomelli’s works were performed. Here he produced a great number of operas and other compositions, by which he acquired great reputation, and totally changed the taste of vocal music in Germany. On his return to Italy, he left all these productions behind him, upon a supposition that he should again resume his station at Ludwigsburg, after visiting his native country. But as he never returned thither to claim these compositions, they fell into the hands of his patron, the duke of Wurtemburg, who preserved them as precious relics of this great master. Very few of his entire operas were ever performed in England. 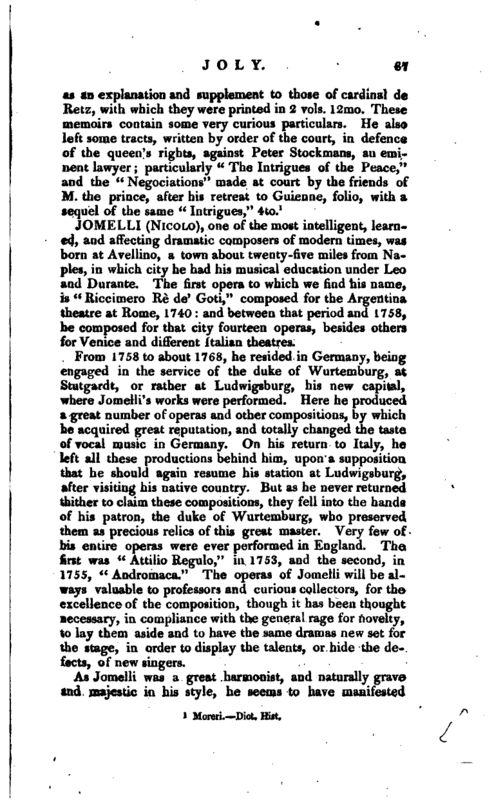 The first was “Attilio Regulo,” in 1753, and the second, in 1755, “Andromaca.” The operas of Jomelli will be always valuable to professors and curious collectors, for the excellence of the composition, though it has been thought necessary, in compliance with the general rage for novelty, to lay them aside and to have the same dramas new set for the stage, in order to display the talents, or hide the defects, of new singers. 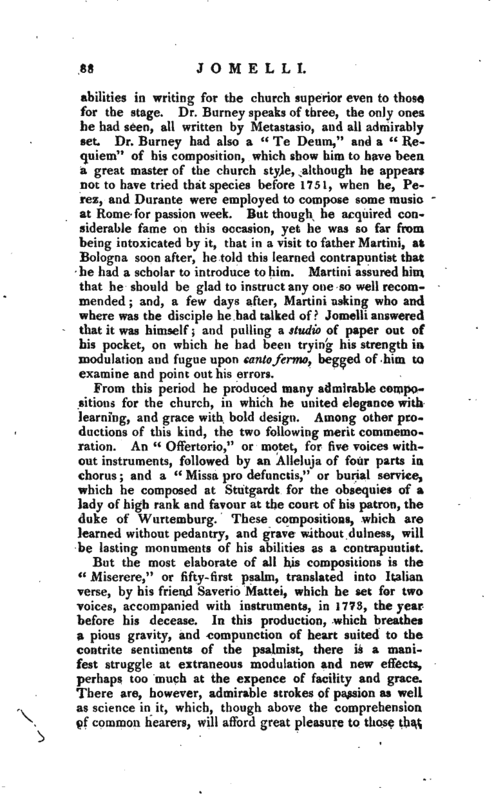 As Jomelli was a great harmonist, and naturally grave and majestic in his style, he seems to have manifested | abilities in writing for the church superior even to those for the stage. Dr. Burney speaks of three, the only ones he had seen, all written by Metastasio, and all admirably get. Dr. Burney had also a “Te Deum,” and a “Requiem” of his composition, which show him to have been a great master of the church style, although he appears not to have tried that species before 1751, when he, Perez, and Durante were employed to compose some music at Rome for passion week. But though he acquired considerable fame on this occasion, yet he was so far from being intoxicated by it, that in a visit to father Martini, at Bologna soon after, he told this learned contrapuntist that he had a scholar to introduce to him. Martini assured him that he should be glad to instruct any one so well recommended and, a few days after, Martini asking who and where was the disciple he had talked- of Jomelli answered that it was himself and pulling a studio of paper out of his pocket, on which he had been trying his strength in modulation and fugue upon canto fermo, begged of him to examine and point out his errors. From this period he produced many admirable compositions for the church, in which he united elegance with learning, and grace with bold design. Among other productions of this kind, the two following merit commemoration. An “OfTertorio,” or motet, for five voices without instruments, followed by an Alleluja of four parts in chorus; and a “Missa pro defunctis,” or burial service, which he composed at Stutgardt for the obsequies of a lady of high rank and favour at the court of his patron, the duke of Wurtemburg. These compositions, which are learned without pedantry, and grave without dulness, will be lasting monuments of his abilities as a contrapuntist. But the most elaborate of all his compositions is the <c Miserere," or fifty-first psalm, translated into Italian verse, by his friend Saverio Mattei, which he set for two voices, accompanied with instruments, in 1773, the year before his decease. In this production, which breathes a pious gravity, and compunction of heart suited to the contrite sentiments of the psalmist, there is a manifest struggle at extraneous modulation and new effects, perhaps too much at the expence of facility and grace. There are, however, admirable strokes of passion as well as science in it, which, though above the comprehension of common hearers, will afford great pleasure to those that | are able to read the score, or to follow the performers through the labyrinths of art. This admirable composer had, in general, such a facility in writing, that he seldom courted the muse at an instrument; and so tenacious a memory, that Sacchini said he frequently composed an air on opening a book of lyric poetry, while, like a peripatetic, he has been walking about a room, which he remembered a year after, and then committed it to paper as fast as he could write a letter. 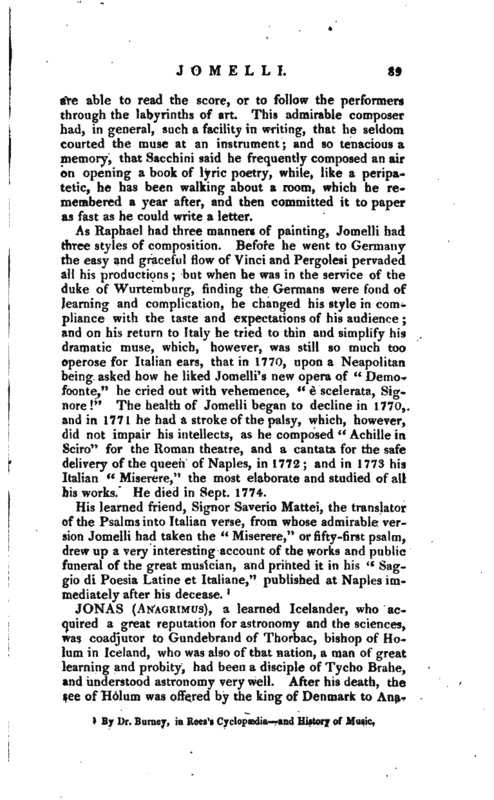 As Raphael had three manners of painting, Jomelli had three styles of composition. Before he went to Germany the easy and graceful flow of Vinci and Pergolesi pervaded all his productions; but when he was in the service of the duke of Wurtemburg, finding the Germans were fond of learning and complication, he changed his style in compliance with the taste and expectations of his audience; and on his return to Italy he tried to thin and simplify his dramatic muse, which, however, was still so much too operose for Italian ears, that in 1770, upon a Neapolitan being asked how he liked Jomelli’ s new opera of “Demofoonte,” he cried out with vehemence, “e scelerata, Signore” The health of Jomelli began to decline in 1770, and in 1771 he had a stroke of the palsy, which, however, did not impair his intellects, as he composed “Achille in Sciro” for the Roman theatre, and a cantata for the safe delivery of the queen of Naples, in 1772; and in 1773 his Italian “Miserere,” the most elaborate and studied of all his works. He died in Sept. 1774. By Dr. Burney, in Rees’s Cyclopædia and History of Music.